According to a press release from the University, the band will march in the following parades: Excalibur on Feb. 17, in Nyx on Feb. 22, in Endymion on Feb. 25 and Orpheus on Feb.
“We’re switching it up this year to play for different audiences and to give the band members new experiences,” said Barry Spanier, director of bands at Tulane University. “They’re looking forward to marching down Canal Street with Endymion." The band first marched in 2006 with only 25 students. Now they are up to 90 and hope to grow even more for next year. 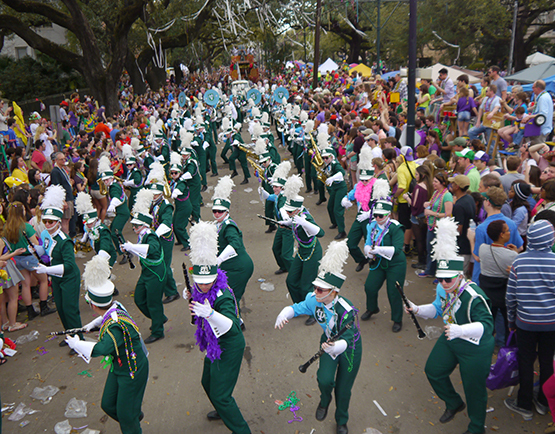 One of the coolest parts of the parades are the marching bands and in the Tulane Band they have some fun traditions that only happen during Mardi Gras. Their traditions include playing the university fight song when spotting a house sporting Green Wave pride, entertaining locals tailgating under the overpass at Lee Circle with the crowd-pleasing anthem “War” and even performing “Happy Birthday” for those celebrating their special day.